Congrats to the JMS startup company, Mindful Munchies,Inc., which was awarded the #2 middle school team and #9 overall competing against 80 school districts, 175 teams, and 650 secondary students. The contest was modeled after the hit TV show, "Shark Tank", where potential entrepreneurs attempt to convince a panel of billionaire business owners to loan them money to launch their business ventures. 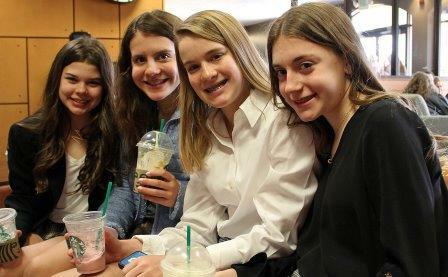 Family and Consumer Science teacher Mrs. Sullivan and her team of young entrepreneurs (eighth graders Macie Miller, Grace Nellas, Leah Kessler, and Ava Tischendorf) traveled to Bloomsburg University and appeared in a FOX56 feature.